It looks and acts custom-modded, but the truth is under the hood--right next to the four Titan X graphics cards. When you throw down a fat roll of Benjamin’s for a top-end gaming PC, you’re going to want to feel like you got what you paid for it. While the cheap—err, frugal crowd will never agree on the cost, it’s hard to believe anyone could disagree that Maingear’s Epic Force X99 isn’t one hell of an impressive rig. One glance at the specs will have any hardware aficionado swooning: First there’s the Intel top shelf Core i7-5960X chip overclocked to 4.5GHz, then there’s the 16GB of DDR4 running at 2800MHz, and finally there’s four GeForce Titan X cards. Maingear’s Epic Force X99 is custom liquid-cooled beast with four Titan X GPUs. That’s usually enough hardware to get anyone to agree that yes, this is bad-assery at its best. The real magic of Maingear’s Epic Force X99, though, is the way it’s all put together. There’s no off-the-shelf cooling or air-cooled GPUs here. 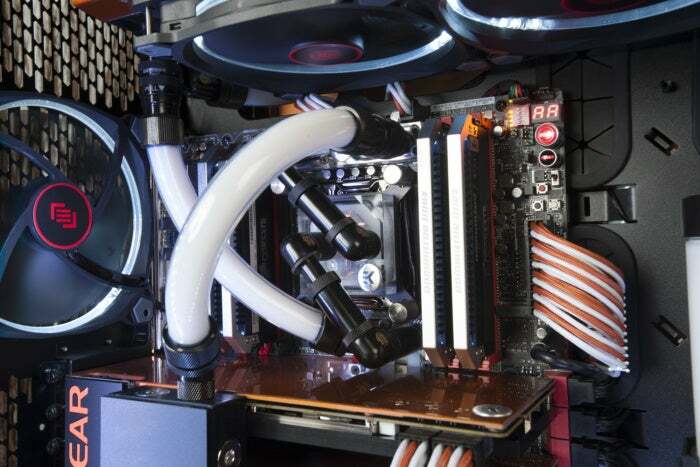 Instead you get incredibly beautiful liquid cooling. After all, anyone can slap four $1,000 video cards into a case and thumb the power switch. But liquid-cooling them and not having it all look like Mario did the job while jumping over barrels? That takes skill. The plumbing in the Epic Force X99 is so beautiful you almost want to kiss your fingers and waving your hands in the air while saying in a faux accent, magnifique! Maingear doesn’t just cool the GPUs in the Epic Force X99, it goes all in and puts water blocks on the voltage regulators and chipset too. 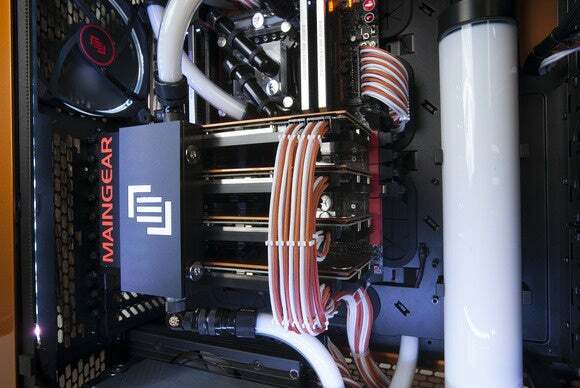 The liquid cooling isn’t done with low-end parts: Maingear sources its water blocks from EK. The cooling also doesn’t just stop with the GPUs—the company actually cools the motherboard’s voltage regulators and chipsets, too. The GPUs still get plenty of love, though. The water blocks are also sourced from EK and feature backplates that are custom-painted to match the exterior. The enlarged reservoir is used to minimize maintenance by customers, Maingear tells us, which the water loop is designed to be serviceable. 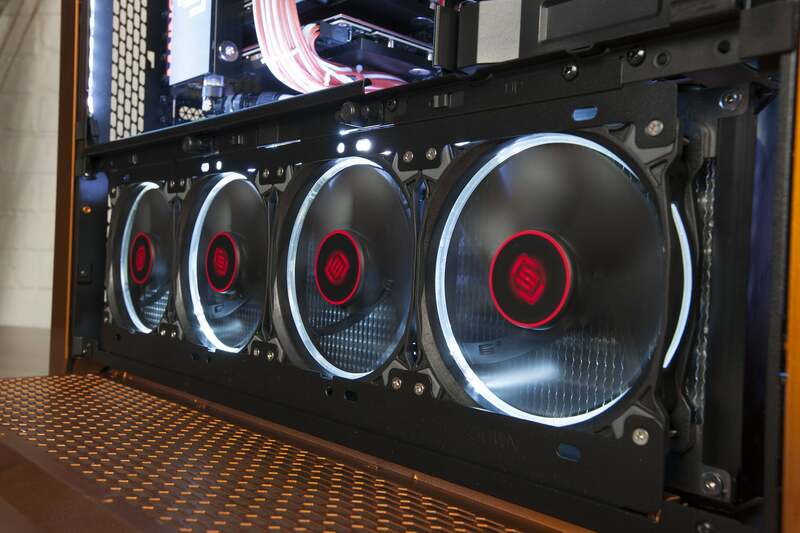 Maingear said a customer could disconnect the GPUs and bypass them if they wanted to run different video cards without liquid cooling down the road. This class of customer, though, will probably just ship it back to Maingear to have the cards replaced. The four GeForce Titan X cards stay quiet even after long loads thanks to the full liquid cooling which also happen to be beautiful. All this would mean nothing if the Maingear Epic Force X99 it didn’t perform. You needn't worry: In gaming, it's simply the fastest system we’ve seen to date. Like all facts though, that’s meaningless without context. The multi-card systems easily race away from the single-GPU systems, but we also see the dividends gets much leaner going from three Titan X cards to four of them. 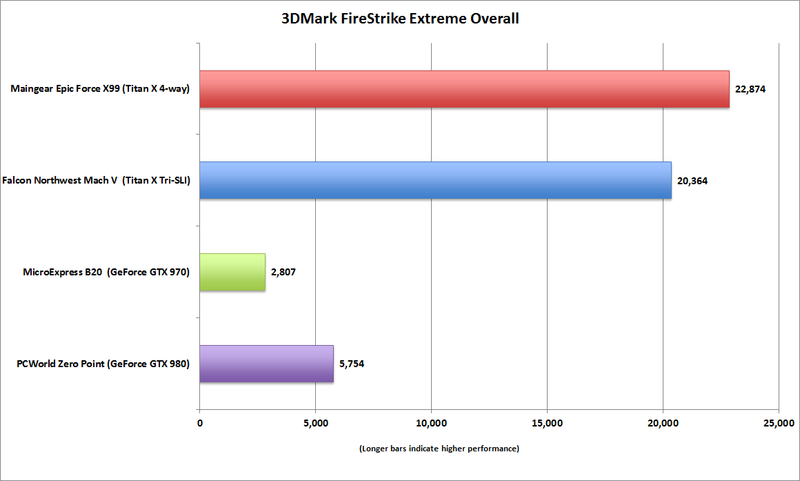 For example, in the synthetic graphics test 3DMark FireStrike Extreme, it destroys our zero-point system with its single GeForce GTX 980, but you’ll see the Epic Force’s score isn’t exactly a death blow to the Falcon Northwest Mach V reviewed here with its three Titan X cards. That’s because the Maingear (and the Falcon too) begin to run into multi-card GPU scaling issues that make the return on investment pretty lean. Going from one card to two will probably net you an 80 percent increase in performance. 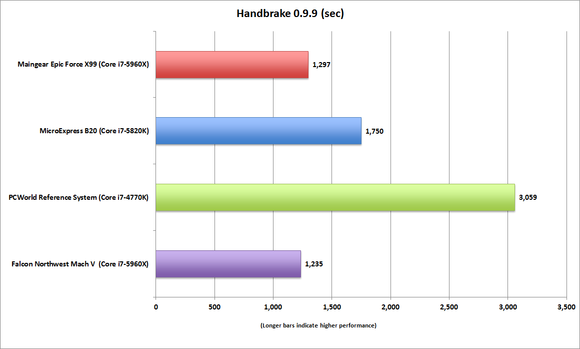 You’ll get less going from two to three, and the payouts dwindle even further going from three to four GPUs. In real-world gaming at 4K resolutions, you can see the scaling get smaller as you go from one Titan X to three and finally to four cards in the Maingear box. You can see scaling issues in Middle-earth: Shadow of Mordor. In this comparison chart, I’ve lined up the 4-way Epic Force X99 against the Mach V with its three Titan X cards and also threw in the result from our GPU test bed, a Core i7-5960X with a single Titan X installed. 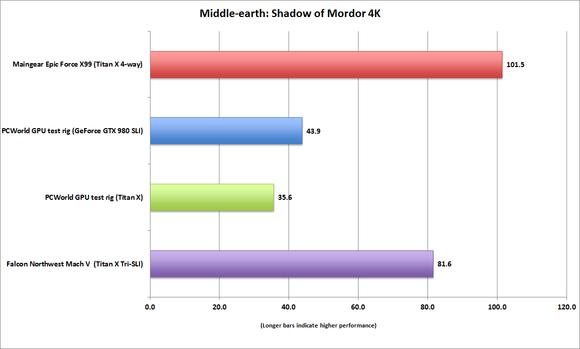 Running Middle-earth: Shadow of Mordor at 4K resolution with the HD texture pack installed you get a little more than a 20-percent performance increase going from three cards to four. That’s really not bad. But then, a single Titan X gives you 35.6 fps; if it scaled perfectly, three cards would have been about 106 fps and four really would have been 142 fps. Multi-GPU scaling will vary from game to game and depend on the resolution you’re playing, but generally it decreases as you climb above two cards. That’s the way multi-GPU setups have worked since the beginning. We’ve never gotten 100 percent scaling. Four GeForce GTX 980 cards, for example, probably would perform at or below three Titan X cards. The Maingear Epic Force X99 and its overclocked Core i7-5960X eats the quad-core and hexa-core systems but the Falcon Northwest Mach V is just a bit faster. When you move beyond gaming performance, the Maingear hangs right there with the other Core i7-5960X-based 8-core systems. 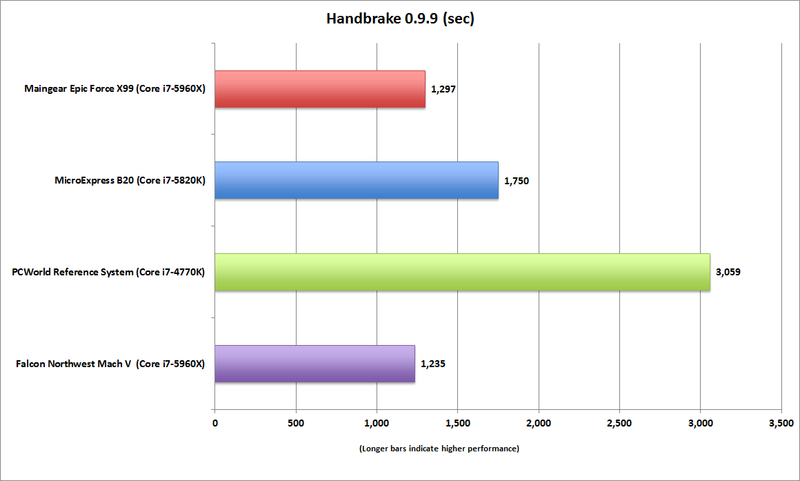 For example, in our Handbrake test, where we take a 30GB MKV high bit rate and convert it to a tablet-friendly format, the Epic Force X99 is just about dead-even with the Mach V system. Both run the same Intel CPU at the same overclocked speed of 4.5GHz. That’s a testament to what Falcon is able to do with what is essentially an off-the-shelf, closed-loop cooler compared to the complicated custom liquid cooling in the Epic Force X99 box. The Epic Force X99 definitely looks cooler, if that matters to you and frankly, it usually does to most people shopping at this end of the spectrum. The liquid-cooling on the Epic Force X99 also keeps it quieter than the Mach V. The Mach V is surprisingly quiet for a three-GPU system but it can’t compete with a full liquid cooling setup, so that’s definitely a win for Maingear. The lower section houses one of two radiators in the Epic Force X99. We can’t let this review go without criticism. However, the two things I want to complain about may not be within the control of Maingear. The first is storage. The Epic Force X99 came with three 256GB Samsung 850 Pro drives in RAID 0 and a 3TB Seagate hard drive. That’s about a 1GBps of read speed from the RAID array which would be impressive if this were 2013. In the age of 2.7GBps read speeds from a single Intel 750 drive, it’s a bit of a yawner. The issue, of course, is how to get an Intel 750 drive to even work in a system this heavily packed with hardware. You can read more about this problem here. The other complaint is the lack of a custom chassis. The paint job is exotic-car quality, with enough clear coats to feel like it’s bathed in butter. 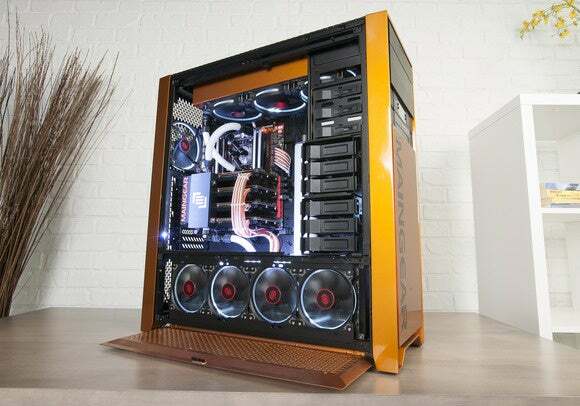 But the chassis, besides a custom front face plate, is an off-the shelf Corsair 900D case. It’s a bit like wearing an off-the-rack dress with some touch ups to the Oscars. To be fair, vendors who have chased custom cases sometimes find it to be a major headache or bankruptcy-causing move, so maybe this is actually the smarter move. I’m also not sure sure any one can tell this this is an off-the-rack case. 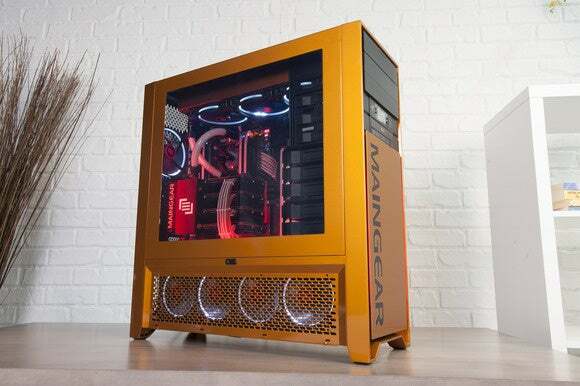 The Maingear Epic Force X99 features fullly custom liquid cooling and a lucious custom paint job. Ultimately what you get from the Epic Force X99 is the look and feel of a custom-modded machine you’d be proud to show off without having to put the blood, sweat and tears into actually having to build it. As someone who's done it before and succeeded and failed, sometimes it’s just a lot easier pick up the phone and order one. You just have to have the funds to do it. At this point, why not round it up to $11,000?